On Friday I finished up the new SNEW record that I've been producing with a mastering session with Eddy Schreyer at Oasis Mastering in Burbank. 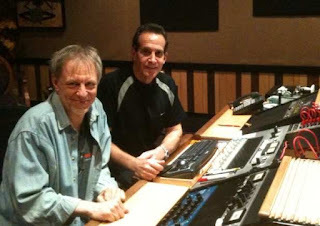 Eddy's been my good friend of many years, but he's also long been the mastering engineer of choice for stars like Prince, Van Halen, Eric Clapton, Kenye West, Christina Aguilera, Black Eyed Peas, Bob Dylan and many many more. Since I only do a music project every year or so these days, it's easy to forget just how great he is at what he does. I've learned a lot about mastering from Eddy over the years, and much of it has made it into "The Audio Mastering Handbook," but as I've always said, just knowing how to do something doesn't make up for the ears and experience of an elite mastering engineer. All it takes is a session like I just had to realize how important a mastering master like Eddy really is to a project. Mastering tools today are very powerful and in the wrong hands can destroy a project instead of making it better. In the hands of one of the elite mastering engineers like Eddy (there are only 5 or 6 of them), the project will end up sounding better than you ever thought it. 1) He now uses an all digital signal path. Part of both the mystique and ability of the professional mastering engineer used to be the high quality analog and digital outboard gear they had available. Even if a project originally resided in the digital domain, the expensive outboard gear was a key ingredient in the final result, since you couldn't get the same quality any other way. Oasis still has a wide variety of high-quality outboard gear, but it's rarely used these days. Eddy's entire signal path now lies in the DAW, with the excellent UAD plug-ins the ones most used. 2) It's always been pretty normal for a brickwall limiter to sit last in the signal chain to protect from any digital overs, but Eddy has eliminated it completely from his signal path while still getting as much level as ever by using multiple compressors. This results in a competitively loud record that still breathes dynamically and doesn't feel squashed. Getting this much level without the help of a limiter is a feat that only a rare few mastering engineers can accomplish. 3) It sounds so analog. Another reason that the pros used their analog gear whenever they could is because digital just didn't sound that good, but Eddy manages to make it sound so analog even with a signal path that's all "in-the-box." 4) This point isn't so much about evolution as much as an observation on how a "mastering master" works. As said before, the variety of ever-so-powerful tools on the market make it pretty easy for someone without the skill and experience to really mangle a song in the worst possible way. A pro like Eddy makes a lot of relatively small moves that make a huge difference in the end. It's amazing how .5 or 1dB here or there and a dB of compression here and there can make such a difference. In the case of the SNEW record, suddenly parts that were buried were now defined, vocals and guitar solos that seemed just a bit low came to the front, the low end between the kick and bass guitar evened out, and everything got punchier. These mixes were great before (thank you Ed Cherney) but Eddy just took them to another level. I'm sure that you want to hear examples, and if it wasn't for an embargo, I'd play you some before and after. That being said, there'll be some examples when the record is released, as well as an interview with Eddy and Gene Grimaldi (he just mastered the Lady GaGa hits) in some future posts. And if you like hard rock, I'm sure you'll be hearing a lot of the SNEW record very soon. It's a killer. By my count, there are 8 “constants” that we find in vocal recording. These are items or situations that almost always prove to be true. Just keeping them in mind can save you a lot of trouble in the search for a sound that works for you and your vocalist. Here are a few tips taken from The Recording Engineer’s Handbook and the upcoming Music Producer’s Handbook to help you get a great vocal sound quickly and easily without any of those nasty side effects. 1) Your mic selection, amount of EQ, and compression used is totally dependent on the voice you are recording. Setting up the same signal chain for everyone might work sometime, but best to keep an open mind (and ears) before you settle on a combination. 2) The best mic in the house doesn’t necessarily get the best vocal sounds. There is no one microphone that works well on everything, especially a instrument as quirky as the human voice. 3) A singer who is experienced at recording knows which consonants are tough to record and knows how to balance the them against the vowels to get a good final result. A singer with this kind of experience will make you look like a genius. 4) With a good singer, many times you'll get “the sound" automatically just by putting him/her in front of the right microphone. On the other hand, with a bad singer (or even a good singer that just doesn't adjust well to the studio), no amount of high priced microphones or processing may be able to get you where you need to go. 5) In general, vocals sound better when recorded in a tighter space, but not too tight. Low ceiling rooms can also be a problem with loud singers as they tend to ring at certain lower mid range frequencies, which might be difficult to eliminate later. 6) Windscreens are actually of little use when recording a vocalist with bad technique. There are two different sorts of people in this category: the people who have never sung with sound reinforcement, and the people who have developed bad habits from using a mic on stage. 7) Decoupling the stand from the floor as well as the microphone from the stand will help eliminate unwanted rumbles. Often times a microphone isolation mount isn't enough. Place the stand on a couple of mouse pads or a rug for a cheap but efficient solution. 8) Just marking the floor with tape might get the vocalist to stand in the right position in front of the mic, but she can easily move her head out of position. An easy way to have a vocalist gauge the distance is by hand lengths. An open hand is approximately eight inches while a fist is about four inches. By saying, “Stay a hand away”, the vocalist can easily judge his distance and usually doesn’t forget (see the grapic on the side). We'll discuss vocal recording in more depth in a future post. The Making Of "Sympathy For The Devil"
I love watching how other people record since each session is so unique. What works for one artist or band probably won't work for another, or even for that same artist at another time and place for that matter. But I especially love to see how some of the songs that we've come to know as "classics" were recorded since everything was a lot more primitive in some ways (the limited number of tracks available), and lot better than today in others (the higher sound quality). 1) Note how large the studio was, and the height of its ceiling. This was common for most studios of the time. 2) Note that the control room was raised so it overlooks the studio, also a characteristic of studios of the time. 3) Notice how everyone is playing the basic track together, and aside from some baffling, they weren't particularly concerned with leakage since all the instruments are placed relatively close together. 4) Notice how the song changes shape as they go along until it becomes the song that we know today. 5) Notice how Keith Richards ends up playing bass while bassist Bill Wyman plays percussion. 6) It's interesting that the lead and background vocals were recorded at the same time, probably because they only had a single track for vocals. It's also interesting that Mick is singing into a Shure dynamic mic (it looks like a model 565, which was a common PA mic of the day), instead of one of the many large diaphragm tube mics that we so revere these days. A while back we were lucky enough to do an interview with pedalboard maker to the guitar gods Bob Bradshaw for the Guitar Universe television show (I'm one of the show's producers). While even some mainstream manufacturers have delved into this product niche, Bradshaw's pedal boards have long been the gold standard and are the key to the on-stage and studio rigs of such guitar luminaries as The Edge, Steve Lukather, Eddie Van Halen and David Gilmore, to name just a few. Besides pedalboards and their associated switching networks, Bob's Custom Audio Electronics now also makes their own guitar preamps and amplifiers, as well as a whole range of specialized pedals and ancillary devices. Bob's a fascinating guy who's truly dedicated to his customers and their sound. I think you'll enjoy the interview. Before the Superbowl fades away into a distant memory, I thought I'd provide some quick notes on the halftime show with The Who. 1) The staging was fabulous. Whoever designed the elaborate staging should be getting more recognition because it was really unique and inpressive. It's hard to believe that it was put together in 4 minutes and even harder to believe that it actually worked having such a short setup time, though they reportedly used 600 volunteers to get the job done. 2) The entire stadium singing along was so cool. Everyone singing "It's only teenage wasteland," and "Won't get fooled again," gave me chills from all the energy. There's been some really great halftime performances before, but I don't remember anything that dramatic (of course, I'm a big Who fan). 3) No fake crowd this time. One of the things that ruined the previous halftime shows for me was the fake crowds in front of the stage with obviously staged enthusiasm. This time the staging was too big for that, and thankfully it was in the dark so it was even more like a real concert. 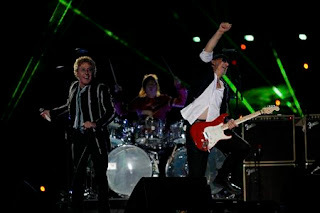 4) The Who played pretty well. They're a great live band that gathered steam as they went along. Roger Daltrey was in the best voice I've heard him in for a long time as he hit all the notes even though he has to strain to do it any more. My God, these guys can still rock hard in their mid-60's! "Hope I die before I get old," indeed. 5) Zac Starkey is a great drummer. That's Ringo's kid playing drums and he's all too overlooked. Zac is the best drummer The Who has had since Keith Moon died. Of course, it helps when your father is a world-class legend (who is vastly under-rated himself). Word is that Zac even took lessons from Moonie when he was kid, so it appears he was destined for this. In a related note, I thought that Carrie Underwood's rendition of the nation anthem was really great, despite the clunker of a last note. She has some real pipes and a lot of guts to go out there by herself without backing musicians in front of 106 million people. I wasn't a fan before, but I am now. Her producer Mark Bright raved about her in a recent interview for my upcoming book The Music Producer's Handbook. Now I know why. Now back to our regularly scheduled programming. This post may look like a review, but it's not since I've never used the following item. It was brought about by a post on Wired regarding some products from the recent NAMM show. 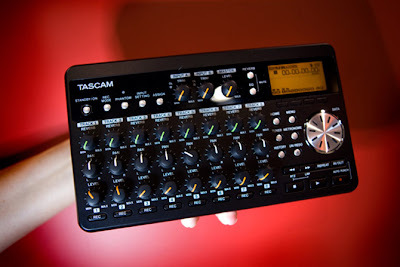 Nothing caught my eye except for one product that I missed at the show - Tascam's 8 track digital Portastudio. There are few times when an obsolete product gets a successful revival and facelift to where it becomes a modern and useful version of its previous form, but Tascam has continually reinvented one of the most useful devices for a musician to ever hit the musical instrument market - the Portastudio. Tascam invented the portable recording studio category and literally started a revolution in 1979 when it delivered it's Model 144 Portastudio, an awful sounding 4 track recorder that used cassette tape as storage. Musician's didn't care about the audio quality though, because it was the first time that they could inexpensively record multiple tracks to get an idea down or even make a demo. Despite it's limitations, artists like Bruce Springsteen, John Frusicante, Primas and Marilyn Manson managed to use the device to record material that eventually made it onto their records over the years, so maybe it wasn't as bad as everyone remembers. It was a great learning tool though. When computers became cheap and powerful and recording software a must-have for every musician, the lowly Portastudio fell by the wayside as an entire generation became computer savvy and their desktops and laptops became their recorder. Even though Tascam continually updated the product, eventually even taking it into the digital age, it was still hardware and the musician of the day wanted to record with software. But soon everyone discovered the limitations of the software recorder. It was sometimes unreliable, given to the quirks of the computer foundation it resided on. It certainly wasn't portable (or not as portable as we were all lead to believe), and if you ever tried to capture an idea quickly on a computer DAW, you know that the idea is usually long gone by the time the computer starts recording, thanks to any number of maddening roadblocks. That's why I think that this new DP-08 Portastudio is so amazing. You get 8 tracks, it records on flash memory, it has a built-in stereo mic, it has a built-in reverb, and runs on AA batteries. With a price of only $300 retail, this is a device that should be a no-brainer for every musician to own just to get those musical brainstorms recorded quickly. The DP-08 has some limitations in that it only records 2 tracks at a time and is only 16 bit, but if ever there was a must-have for an artist as a digital scratchpad, this is it. If only I had one of these 25 years ago.